If you’ve created a system image using the Windows 7 Control Panel, you can use this image to restore your computer system in the event of a hard drive crash. You should create a system image on a regular basis (to set this up, go to the Windows 7 Control Panel, System and Security, Backup and Restore, and select Create a System Image in the left pane). When you restore from a system image, you will reformat your hard drive and lose everything! Of course, if your hard drive is truly toast, your data is already gone, and restoring your computer from a system image is your last resort. Fortunately, in addition to your system image, you’ve got recent backups of all your files, right? Insert your Windows 7 DVD and restart your computer. When the Welcome screen appears, click Repair Your Computer. Alternatively, you can boot your computer using your system repair disc, choose Repair Your Computer on the Advanced Boot Options screen, and press Enter. 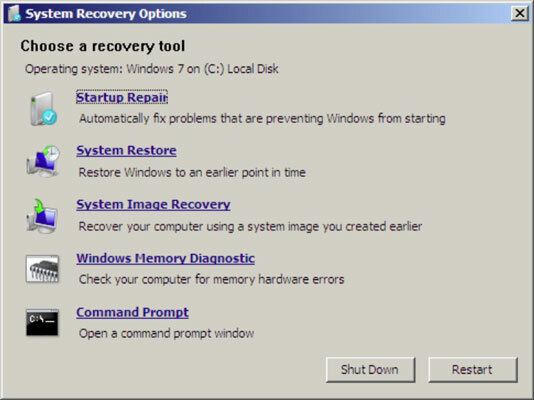 In the System Recovery Options window, select System Image Recovery and click Restart. The System Recovery Options dialog box. When prompted, insert your system image disc. Windows 7 begins restoring your computer’s system image.